Here is the flier and picture from the photo shoot we did a week ago for the Cranksgiving Race. 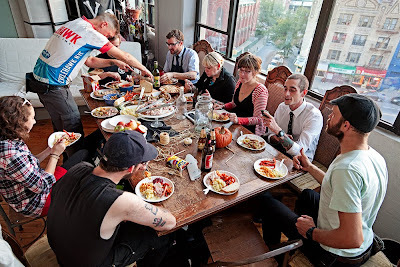 We had a mock thanksgiving and it was incredible! Check out Nate Mumford's photography blog here. He was a great photographer! 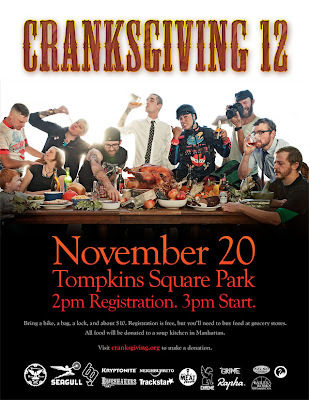 "With over 120 racers, 2009 was the biggest Cranksgiving ever, and New York City's largest alleycat of the year. The race & the cause shows no sign of abating. Over the past two years, we've donated over $2000 in food to Saint Mary's soup kitchen on the Lower East Side. On top of that, two Nazareth Housing & Hudson Guild both each received over 100 jars of baby food each. And on top of THAT, over $2,300 was raised for City Harvest and $700 for the New York Bike Messenger Foundation."